For this flat we design together with client the kitchen, bathroom and bedrooms and made a total renovation. The client had very fixed ideas and our job was to help them getting the house of their dreams in a tiny space. 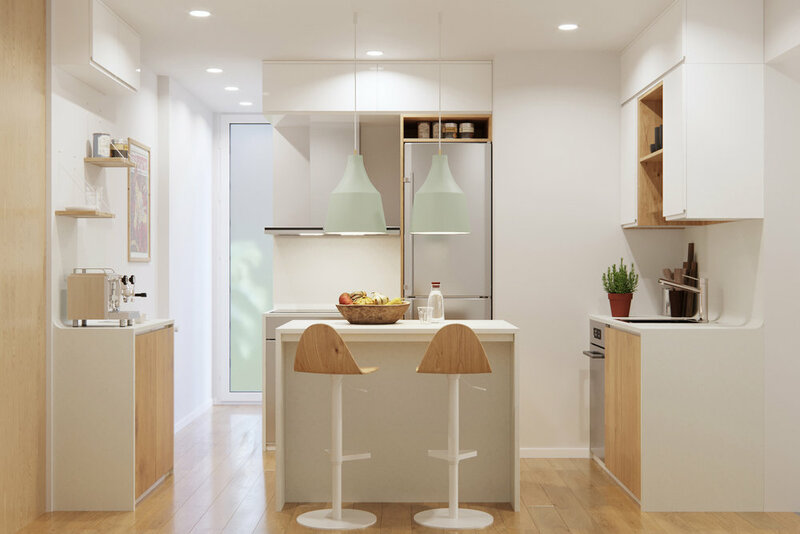 The actual kitchen was an closed space, so client wanted to change it and open the kitchen to the hallway so it became a more liveable space. She imagined herself cooking with their kids and make the space more inviting. The kitchen was designed with great attention to detail and taking advantage of every millimeter. The center island it has wheels to be removable when you need more space. The materials we use are oak, white lacquered wood and Krion*. *Krion is a very flexible but durable material that is easy to clean, does not stain and can adopt curve shapes. We use a curved shape in the back of the wall with countertop so everything is more easy to clean. The result is a nordic but warm kitchen. In the bathroom we needed to change completely the actual distribution and add a bath tube for kids to play and bath. We design a custom size bath tube in microcement and changed the coatings of the walls and floor. The handmade chevron tiles in acqua blue make the space very cosy. The cabinets and custom made storage mirror in oak give the warmed feeling we needed. The rest of the walls are in white tiles, size 120x 60cm to make the space more continuous.